Even if your website is brilliant, people might prefer to interact with you on social media. Social pages are where fans can talk to each other and communicate with you directly. Plus, it’s just easier to track your favorite band on a site you log into every day anyway. Put Facebook, Twitter, and Instagram links at the top of your website that lead directly to your profiles. Many free band website templates are designed with e-commerce in mind – so take advantage of this capability. Let fans who visit your website buy your latest single or album. Whether you sell and ship out CDs yourself or link people to iTunes, promoting sales is a smart use of your online space. The easier it is for your fans to find and pay for your music right on your site, the better. If people can listen to and sample your music on your site, you can convert even more sales. Look for music or band website templates with a calendar feature. You want to keep listeners informed about your upcoming tour dates, local shows, and interviews. If you don’t keep a full calendar, just install a list widget that shows the next 5 to 10 events for your band. Take advantage of links and connect fans directly with the online vendors selling tickets to your shows or other events. Once fans arrive on your website, it’s good to give them a bit of direction about what to do next. Do you want them to download your songs on iTunes? Or would you like all fans to “Like” you on Facebook? Create at least one call-to-action that lets both new and seasoned fans know what they can do to support you today. Free music and band website templates are a user-friendly way to get your band online even if you don’t know much about website design or SEO. Once you customize the text and add vibrant images from your live shows to a free website template, your site can stand out from the rest and reflect your group’s style. And don’t forget to update your band’s site periodically. Updates not only keep fans in the loop about the latest news and music, but they will help your site’s SEO so you continually appear near the top of Google searches for your band name and related terms. 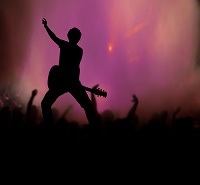 Want to learn more about free band websites? Check out these tips for how to use a free website template.